1- Press those pages – Use a bone folder to crease each page individually or each section really well. Then press the text block at least overnight before you sew. This allows the folds to be as compressed as possible which in turn allows the sewing itself to be tighter. If the pages aren’t pressed well, they will press themselves overtime after you've sewn the book which creates a loose binding. 2- Hole size – Make sure the holes aren’t larger than necessary. Use an awl that fits the size of the needle and thread you will use. If the holes are too large, the thread can shift side to side more. 3- Add more stations. 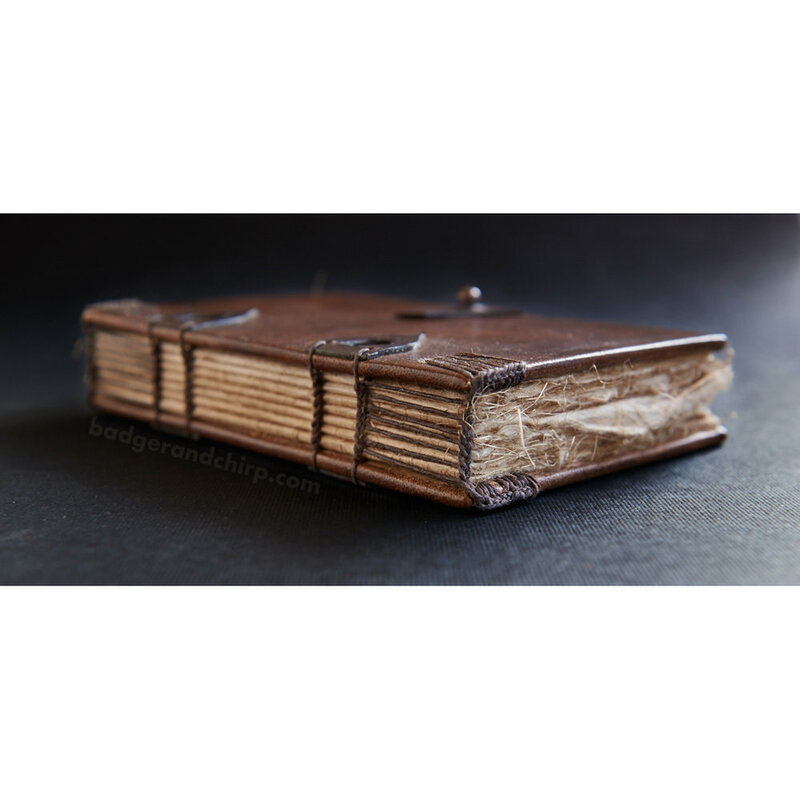 A station is one chain of thread/knots that hold the pages together in a coptic stitch book. If the book spine can allow more stations, consider sewing more in (something you must decide before sewing, unless you re-sew the book). Having more chains along the spine add to the security of the cover. You don’t want too many though. Remember that each hole you add to the spine is technically perforating the page so it can fall out easier. If you have too many holes, the pages will be easier to rip out. Having 6-8 stations along a spine does make a big difference compared to having only 2 though when it comes to helping solidify the feel of the book’s structure. 4- Sew headbands – These help the book to stay in place more by not letting the book covers shift as much. A loose, shifty, feel to the covers in relation to the pages is dramatically tightened up with sewn headbands. 5- Make sure the thread you are using is good thread. Some threads have too much spring in them. An Irish linen thread is my favorite choice. Cotton threads can have more stretch to them which gives a looser binding as the book ages and the pages pull on the threads. Irish is important too. In my experience, linen threads from China are not as durable and are easier to break– the fibers in the thread from China were not as long as the Irish thread I have used has and can be pulled apart easily, which also means your stitching can be torn easily too. 6- Most coptic stitch books made today are left with an open spine, so gluing the spine doesn’t look very nice. It’s possible to glue your endpapers, though. If you glue the endpaper to the cover that is then connected to the fly leaf, you are connecting the covers more securely to the book. This results in much less shifting with the cover and text block. 7- Make sure each stitch is snug. Remember to pull the thread parallel to the spine so that the thread doesn’t rip through the whole grouping. Keep everything tight as you go. There is never a step where you can just tighten it later so remember to tighten as you go. 8- Do not poke through the thread when you are sewing. Double needle coptic stitch requires passing through each hole in the spine twice with a needle. That means there are twice as many opportunities for you to sew right through the thread. Watch it closely because if you go through the thread, the sewing can not be tightened as much. As you go through each hole, pull the previous thread to the side of the hole and then go through the opposite side of the hole with your needle. If you ever even think that you’ve possibly gone through the thread, it would be best to pull out the thread from that one hole and redo the sewing on that hole. 9- Use curved needles. When you open the book while sewing the kettle stitch (the linking stitch you make after sewing through the holes in one grouping of pages), the more opportunity you give the thread to stretch and your sewing to loosen. Curved needles allow you to sew between sections with the book closed while doing the kettle stitch, which will allow the sewing to stay in place and the book to have a more solid sewing job. Want to learn how to curve your own needles? View the tutorial here. 10- Make sure your end knots are solid and as tightly taut as possible. If they are slightly loose, the section they are in and the cover will tend to loosen more than the rest of the book. Keep the end knot tight and close to the book page.